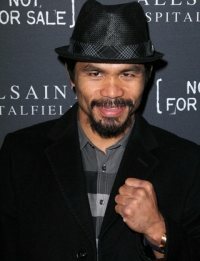 OUTSIDE LOOKING IN: "Las Vegas, here I am, again -- Pacquiao"
With his next fight with Adrien Broner almost done, ring idol and senator Manny Pacquiao braces himself for his return to the United States to defend his World Boxing Association welterweight title against his American challenger from Cincinnati. The soon-to-be 40-year-old Pacquiao last fought in U.S. soil almost two years ago on November 5, 2016, when beat Jessie Vargas via unanimous decision to reclaim the World Boxing Organization version of the 147-pound crown at the Thomas and Mac Center in Las Vegas. The same source said details of the fight like venue, purse, etc will be discussed and finalized on November 7 between representatives of Pacquao’s own outfit, MP Promotions and Broner’s handlers. In his announcement, the eight-division word champ said he would be fighting Broner next, either on Jan. 12 or Jan. 19. In Las Vegas, the source with knowledge of the deal, however, told ESPN the fight would be Jan. 19, not Jan. 12, though a fight likely wouldn't be formalized until both the champ and challenger had affixed their signatures on the dotted line. And that will come, precisely, on November 7 during the signing of the long form contract. About a fortnight ago, Pacquiao was reported as to have signed with adviser Al Haymon, the Premier Boxing Champions founder who controls several named welterweights, including Broner as well as world titleholders Errol Spence Jr., Shawn Porter and Keith Thurman. The Filipino great’s last two fights have been held overseas. In July 2017, in the fight that kicked off the Top Rank/ESPN partnership, Pacquiao lost the title by controversial decision to Jeff Horn in the later’s hometown of Brisbane, Australia, in his final fight with Top Rank as his promoter. During his media appearance in Manila, Pacquiao (60-7-2, 39 KOs), who turns 40 in Dec. 17, said he is hoping for another convincing knockout when he faces Broner. "If I can finish it earlier than seven rounds, why not," Pacquiao said.